Churches prepare for disaster response » On Sabbath, April 14, Michael Bright, L.I.F.T. director for community services and disaster response in the Denver area, was a guest presenter at the Woodland Park Church in Colorado. 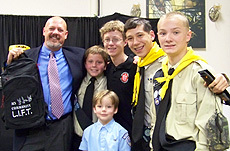 He and the local Pathfinder club led the entire church into disaster preparedness by introducing the "Backpack" program. This disaster preparedness ministry also will be presented in the Summit Fellowship, Leadville and Fairplay churches, in Colorado, where Michael Kissner also pastors. Singles convene in Denver » The North America Single Adult Ministries Convention will be held in Denver! A Spirit-filled program has been planned and will be a blessing to all who attend. Click here to find out how to register. Please note that all Rocky Mountain Conference members who attend the convention will receive a $30 refund at the end of the convention. Work bee held » A work bee was planned for Sunday, April 16, in anticipation and preparation of the Columbine Christian School evaluation. 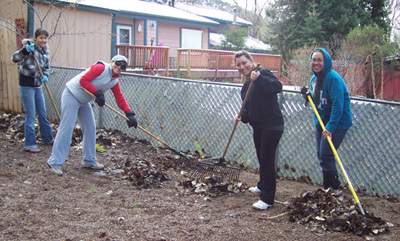 Despite the deep snow on the ground that Sunday morning, the spirits of those volunteering were not dampened. More than 40 people, including parents, church members and a group from the congregation that rents the Glenwood Springs Church, in Colorado, came out in force to clean and beautify the school and church. Church responds to regional natural disasters » There have been a number of natural disasters that have destroyed lives and property within the Mid-America Union. The tornadoes and fires have been especially damaging. Cathy Kissner, Rocky Mountain Conference disaster response coordinator, shares the following information for those who would like to support our church’s efforts to bring relief in these disaster zones. We encourage our members to pray for those affected by the disasters as well as those who so generously give of their time to help others in need. Registration opens for RMC Women’s Retreat » The annual Rocky Mountain Conference’s Women’s Retreat will be held at Glacier View Ranch, Sept. 7-9. The keynote speaker for this year’s retreat will be Hyveth Williams, Ph.D., professor of homiletics at the SDA Theological Seminary at Andrews University in Michigan. This yearly event is always a spiritual blessing to all who attend. The theme this year is “Heart Spa—Chosen for Such a Time as This.” Watch for the event brochures, which should arrive at churches near the first of June. Please contact RMC women’s ministries coordinator, Ginger Bell, at one of the following numbers or email address: 303.659.1999, 720.980.9007, 303.659.4480 or [email protected]. Members added to the family » During the last two Sabbaths, 14 people were baptized and united with the Arvada SDA Church family in Colorado. Milos Tomic, Arvada Church youth pastor, baptized three people: Maritza Lopez, Darrold Randolf and Heather Louiand. Norris Custodio baptized Manuela and Monica Enriquez, his first two baptisms since he joined the Arvada staff as lay pastor for Spanish ministries. Milton Encarcion, a lay pastor at the Centro Cristiano Hispanic Church, baptized eight more people. Karla Borques, Yessika Sanchez, Josefina Martinez, Silvia Hernandez, Julio Eduardo Gutierrez, Argenis Abraham Moran, Anibal Giron and Amaury Mendoza Reyes all publicly proclaimed the Lord as their Savior. Milton and his group have held services in the gym on the Arvada Church campus since January. Finally, Bob Miller, lay pastor from the International SDA Church in Denver, baptized Diana Luttrell into the body of Christ. All of these churches and groups are a part of the Arvada district, led by Gordon Anic, pastor. It is exciting to see how they all work together preparing people for God’s kingdom. Three young people were baptized at the Chapel Haven Church in Northglenn, Colo. this past Sabbath, by Robert Coronado, pastor. Currently, The Edge Church is worshipping at the Chapel Haven Church in the same facility. The young people baptized were Miracle Faith Berg and Shavonne McLeod, both from Chapel Haven, and Natalie Peralta from The Edge. Welcome to the church family! On the road » The second RMC town hall, held last weekend in Grand Junction, Colo., was well attended with a sweet spirit present. As with all of our town halls this year, reports were given, constitutional changes were discussed, and there was an election of representatives to the upcoming nominating committee for our constituency meeting in September. This weekend, my wife, Diane, and I attended the Mid-America Union ASI Chapter Convention in north Denver. The keynote speaker was Shawn Boonstra, former speaker/director of It Is Written and currently an associate ministerial director of the Seventh-day Adventist Church in North America. We really enjoyed the fellowship.